By having an agenda, people can prepare for the meeting and know what is going to be discussed. This also eliminates the conversation going off topic, and provides a clear idea of what you should achieve from the session. People tend to fill the time that they are given in a meeting, so limit the time scheduled. You should also have someone chair the meeting and ensure it keeps moving forward, and doesn’t overrun. Nicole Steinbok introduced a 22 minute meeting when she spoke at Microsoft. The agenda includes starting on time, standing up, no phones, no laptops and noting off topic comments for future discussions. Jeff Bezos who started Amazon created a ‘two pizza rule’: you should be able to feed all meeting attendees with two large pizzas. If you can’t, the scalability may be too big and therefore efficiency lost. A striking principal that would ensure only the necessary people are in attendance. It can be a great tool for visuals, but make sure the presenter isn’t just reading an entire slideshow, verbatim. It isn’t an effective way for meetings to be productive or engage your audience. Doodle reports that mornings are “overwhelmingly the best time to hold a meeting”, and the preferred time being between 8am-12pm. So we suggest if a meeting is of particular importance, an early start may be a good thing. Netcel is a case study that highlights a Smarter Workspace designed for efficient meetings. Whether you are want a quick five minute collaboration on the whiteboard wall, or a more structured choice in a variety of different meeting rooms, Netcel’s workplace accommodates this. View the case study here. Woodhouse can blend scientific analysis of your business with future-proof design, to create a workspace that is bespoke for your employees. We evaluate how your teams are working in your current space and design an office around their requirements. By creating an evidence-based design, our Smarter Workspaces improve productivity and collaboration. 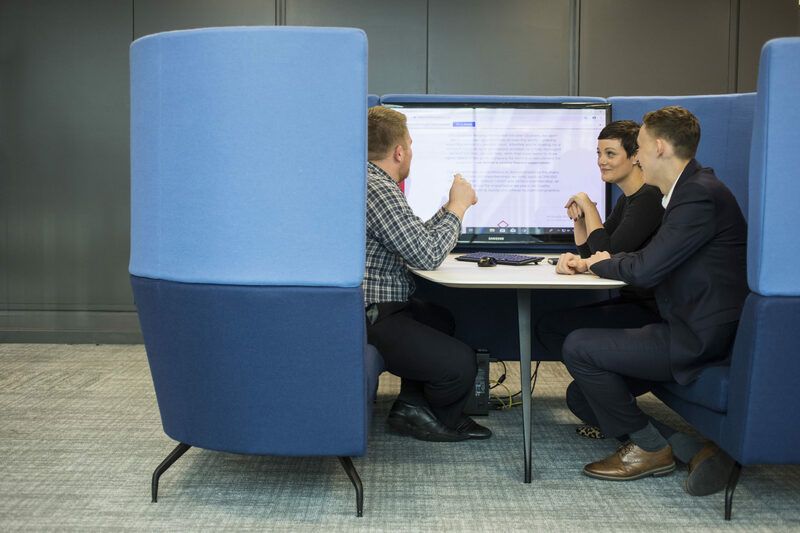 To find out more about how we can deliver your smarter workspace, please call 01707 255300 for a friendly chat with one of the team, or send an email here and we will in touch shortly.